A couple in the midst of downsizing, renovating, and relocating while striving to maintain an environmentally friendly lifestyle. We have been settling in and getting acquainted with the intimacies of the house. The day we moved in my sister Diana helped me organize the kitchen. When she left she told me it was a start and that I would probably rearrange it several times before we landed on a system that works. It’s ironic how well we when know each other and how similar we are in lifestyle. I haven’t moved a thing since that first day and the flow is perfect. The kitchen, which so many months ago I feared would be too small, is actually roomy with plenty of cabinet space. The entire house “lives big” because of it’s open floor plan and tall ceilings. We absolutely love it! Just after we moved in the sewer line broke. A backup of the system into our downstairs shower was the clue. 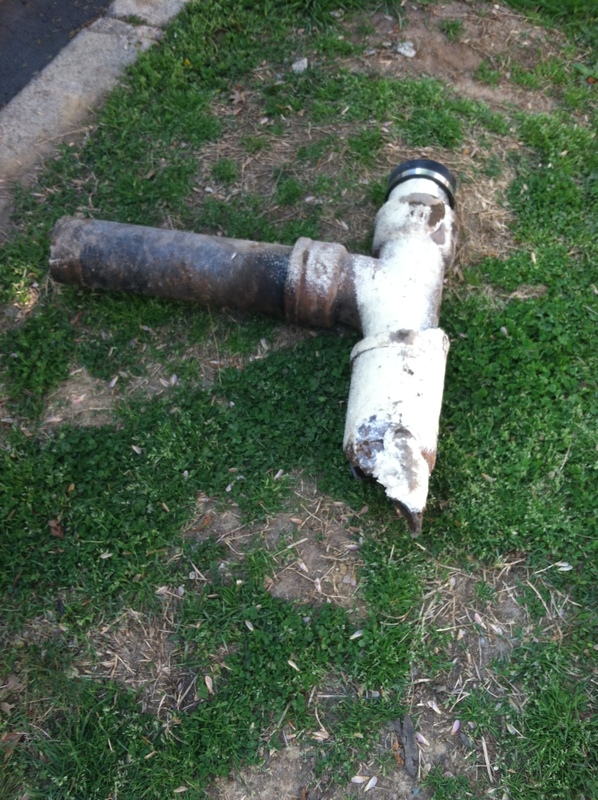 All the plumbing on the inside had been replaced so we knew the problem was outside and started digging. Well, we didn’t start digging, Mr. Rooter started digging and he found a big pocket underground where our waste had piled up for about two weeks until it backed up into the house. The main line was cast iron where it entered the house. That section was strong and clear. 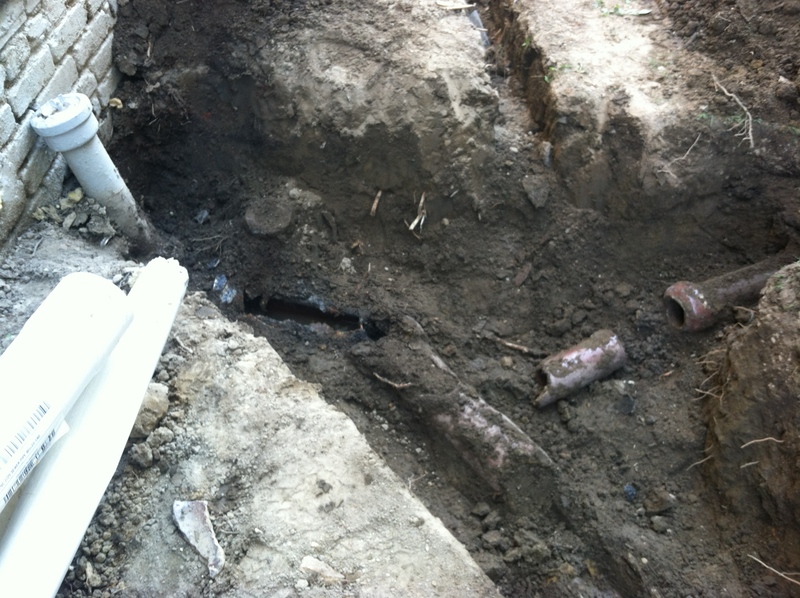 The problem was a few feet down the line where the iron pipe attached to the original terra cotta pipe. That’s right, a 104 year old clay pipe that had been cracked several times and repaired with cement. Apparently the well digging, gas line dredging and significant landscaping had jostled the pipe enough underground that it had crumbled in several places. In hind sight, maybe we should have dug up the line while we were in the demolition phase but in keeping with the spirit of conservation, it seemed superfluous at the time. 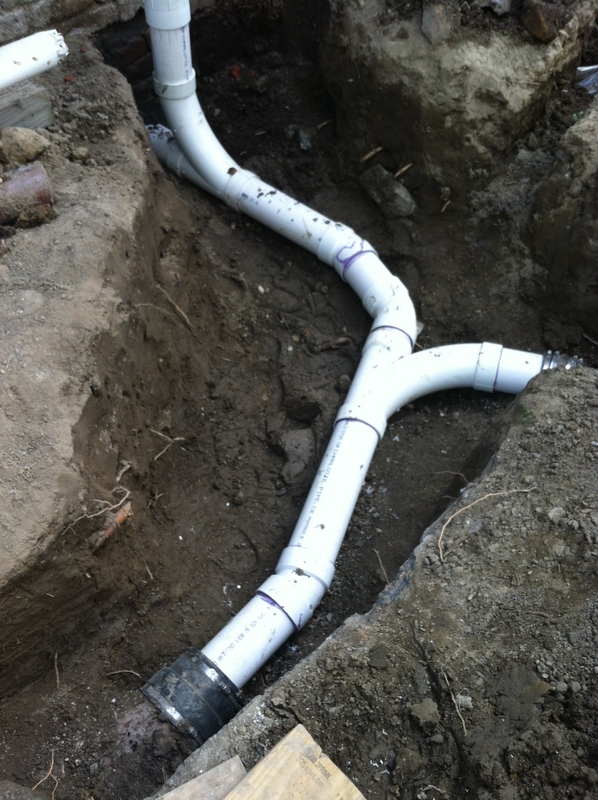 In any case, when the final landscaping is done in the backyard, the last section of pipe will be dug up and replaced and the entire sewer line will be new! An added benefit is that we got to know our fantastic neighbors. Some barely knew us when they welcomed us into their homes for showering! 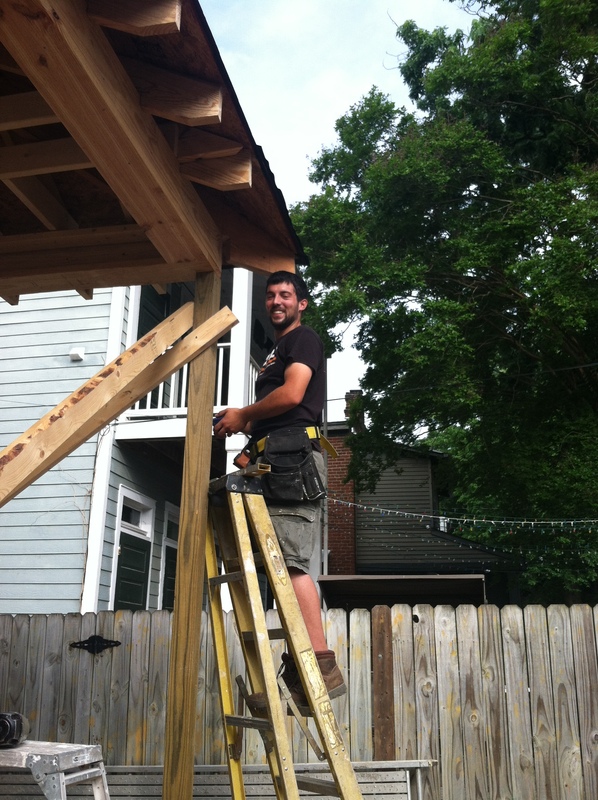 John is now working on the back porch, hoping to get it done before the Richmond heat and humidity become oppressive. 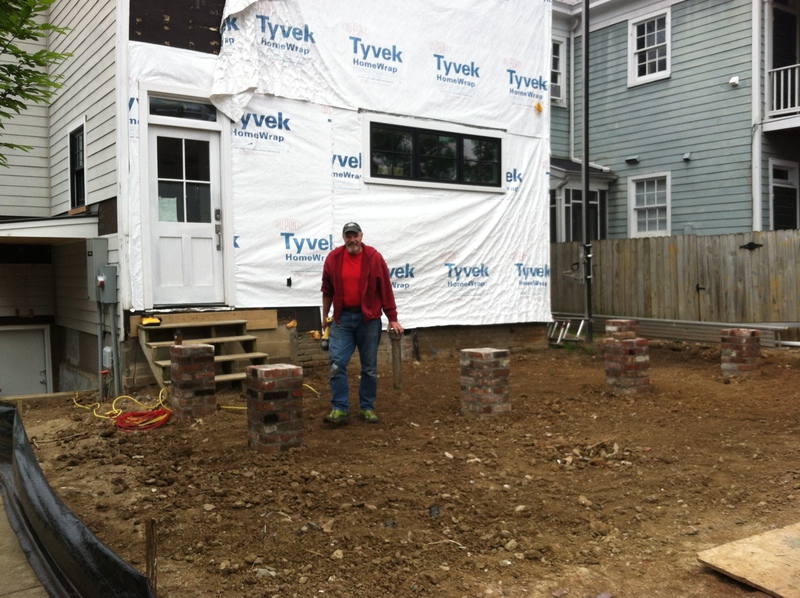 Our project has become a real family affair as Bobby’s son, Stephen, is assisting John with the porch and Bobby’s brother, Michael, will soon dismantle the old cinderblock garage that sits at the back of the lot. It will be replaced with a carport of sorts, or open garage that will have a door to the street but will be open to the inside yard. 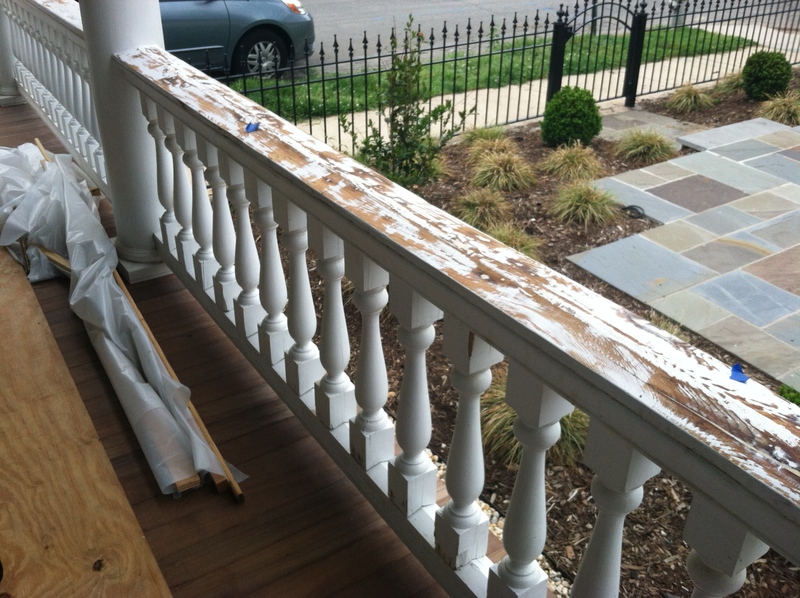 The front porch railings continue to plague us with issues. It rained the entire weekend we moved. 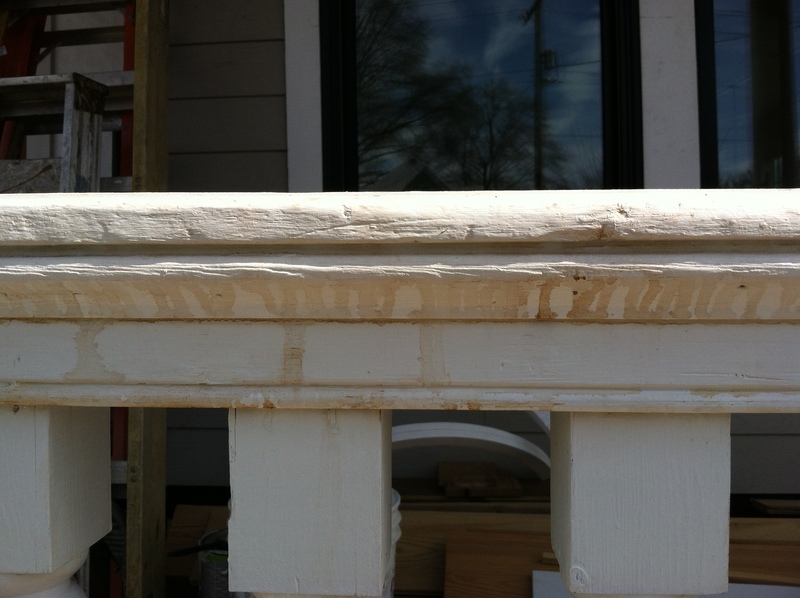 We noticed that the railing paint bubbled and a brown liquid oozed out and dripped down the sides. 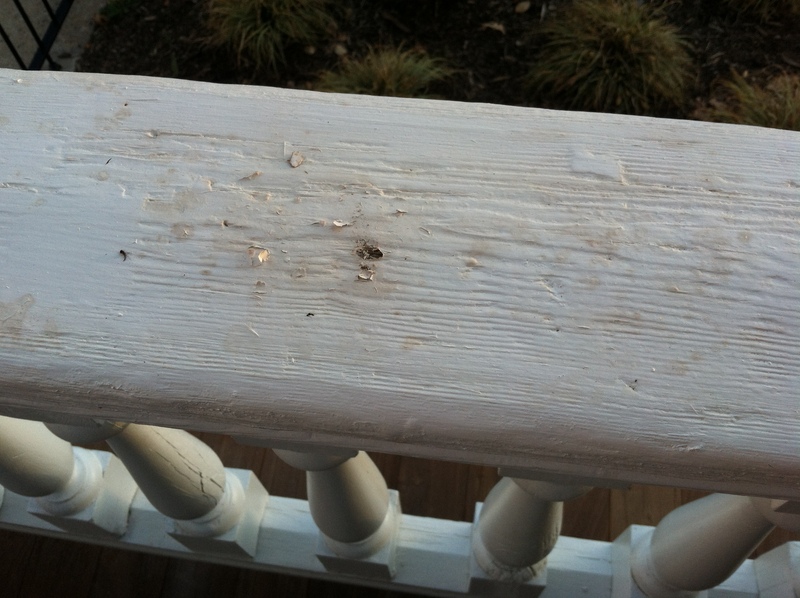 It also oozed out of nail holes in the balustrades. After much investigation it seems that the liquid used in the dipping/stripping bath had not completely dried deep inside the wood. The moisture meter gave a satisfactory reading on the surface so the restoration company felt safe in painting the surfaces. They have returned, scraped the paint form the railings and the nail holes and are waiting for everything to dry completely so it can be repainted. 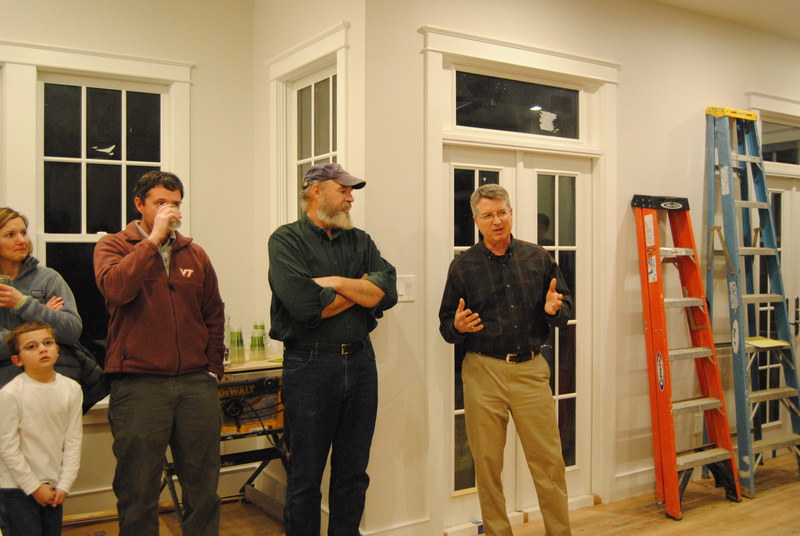 Lastly, we are thrilled with our geothermal system. In particular, I love the hot water feature. 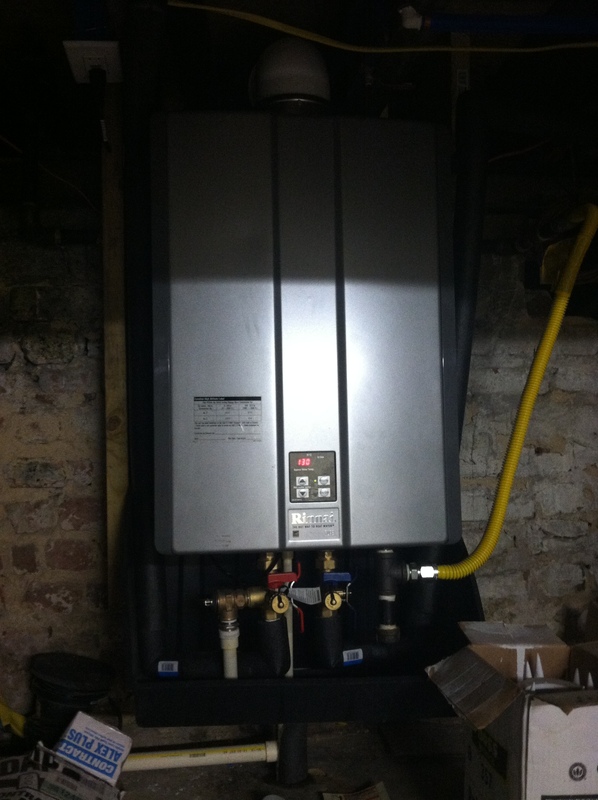 We installed a Rinnai tankless, on-demand hot water heater in conjunction with the geothermal system. The idea behind a tankless system is that it heats the water as you need it instead of continually heating water stored in a tank. Tankless heaters last about five to 10 years longer than a tank heater, take up much less space and provide an unlimited amount of hot water. They cost a bit more and can require new power lines and venting so it’s easiest to install during the building process. The geothermal company has set up our system so that the hot air extracted from the air conditioner is used to heat water that is fed into a holding tank. That warmed water then runs through the Rinnai. The preheated water is so warm some days we don’t even use the Rinnai, just the hot water generated as a by product of cooling our home. That means less heat being dumped into our environment, less energy used to heat water and we never run out of hot water. There is also less guilt for me when I lower the temperature on the air conditioner! 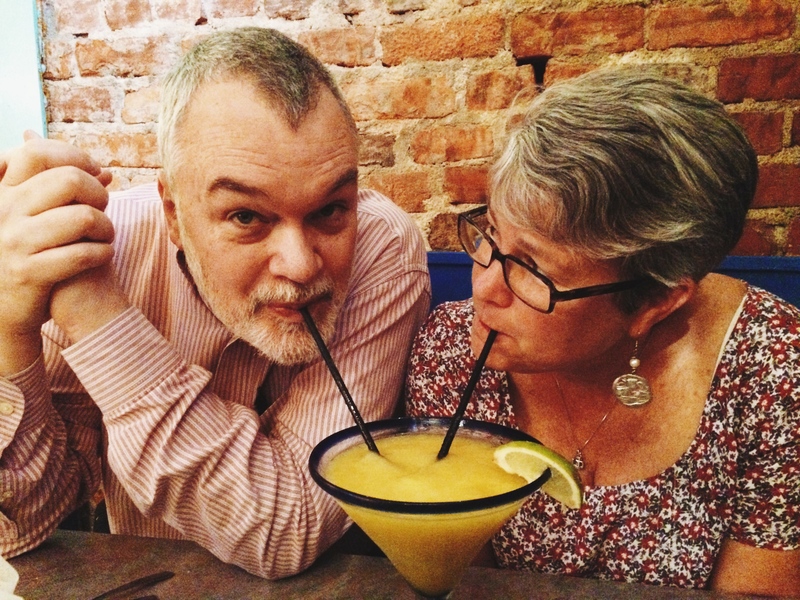 Here we are enjoying one of our favorite Carytown establishments: Nacho Mamas! One of the most charming features of our capitol city is its iron work. I was recently told that Richmond has as more linear feet of wrought iron work than the city of New Orleans. 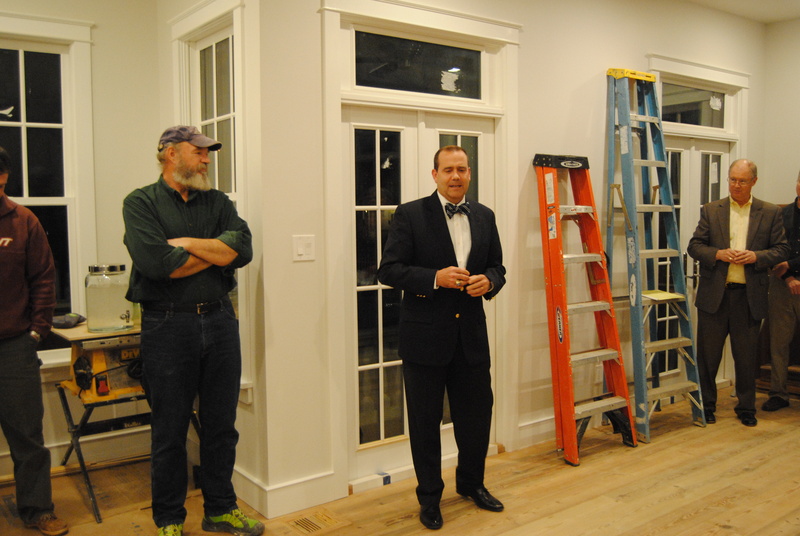 I am not sure that I believe that tidbit but a stroll through The Fan, The Museum District, Jackson Ward, Shockoe Bottom and Church Hill will convince you that it would be a close race! It takes an effort to maintain this once commonplace architectural feature. Thankfully, annual vigilance of removing rust and repainting has preserved miles of this beautiful treasure in our city. At our house we found remnants, broken stems in the concrete sidewalk border, of an original iron fence around the periphery of our front yard. There are a few historical fences in our immediate area still in tact but the majority of homes now have wood or composite fencing. I must admit when I first saw our house I was drawn to the white picket fence that bordered the front yard but it was rotted and falling down so we knew we had to replace it. Coincidentally, a close friend of mine had just moved to Church Hill and we began spending time walking the dogs through the neighborhood streets and parks. You know how you don’t really notice a particular brand of car until you decide to buy it and then you see it everywhere? Well that’s what happened to me with fences. 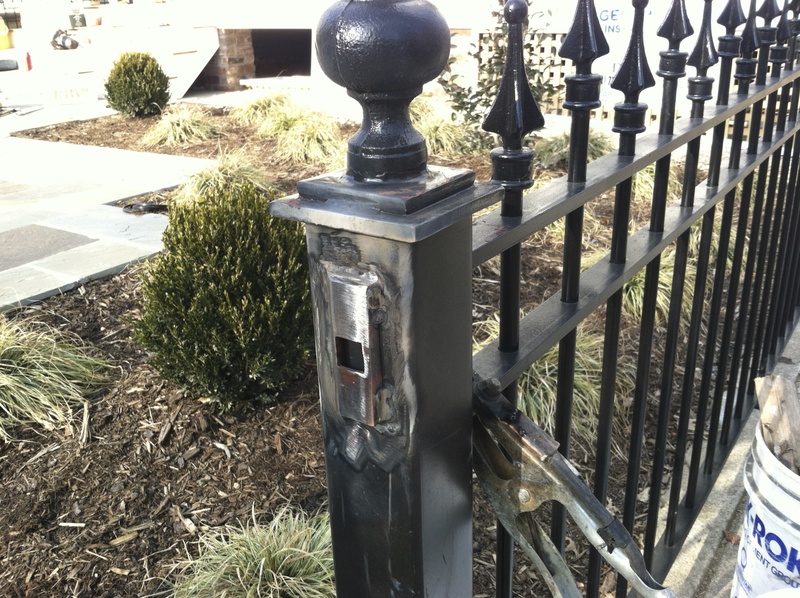 Once we had decided to put up a new fence, I became fixated on fences, especially the wrought iron fences of Richmond. Wow! Do we have some spectacular iron work in our city! 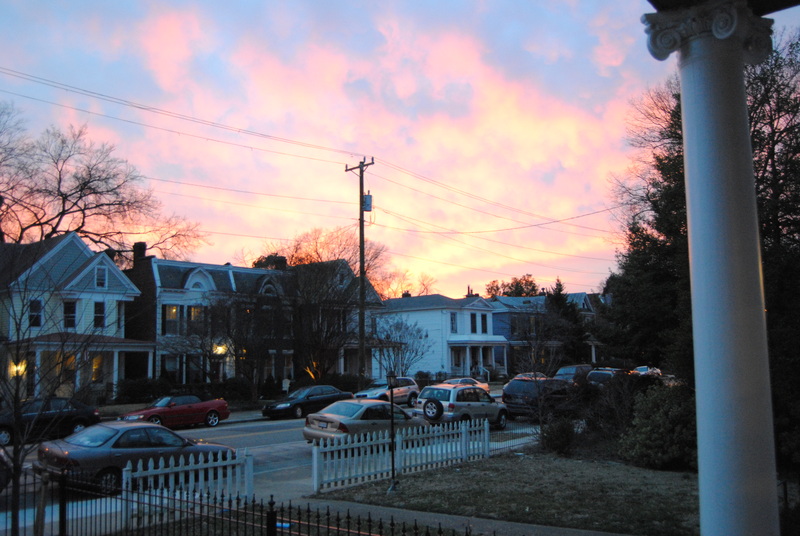 I snapped pics with my old iPhone all over Church Hill and I took long walks from our house down to VCU and back, stalking fences along the way. My photos just didn’t do justice to the craftsmanship. If winter ever pulls out of here, I would love to use our 35mm camera to capture some of the most beautiful fences and railings that I have discovered and publish the photos here. 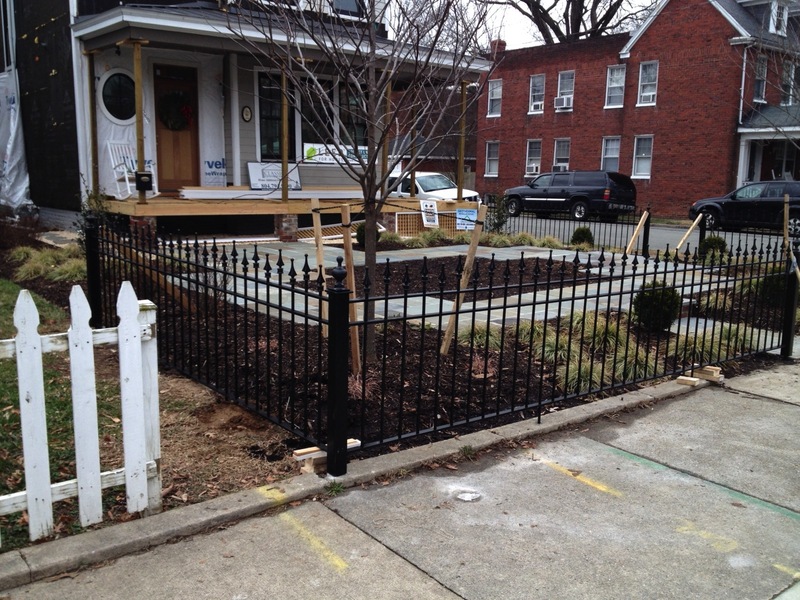 It was decided that we would have a black iron fence installed around our front yard. It wasn’t in the budget but we decided to take the leap and go for it anyway. 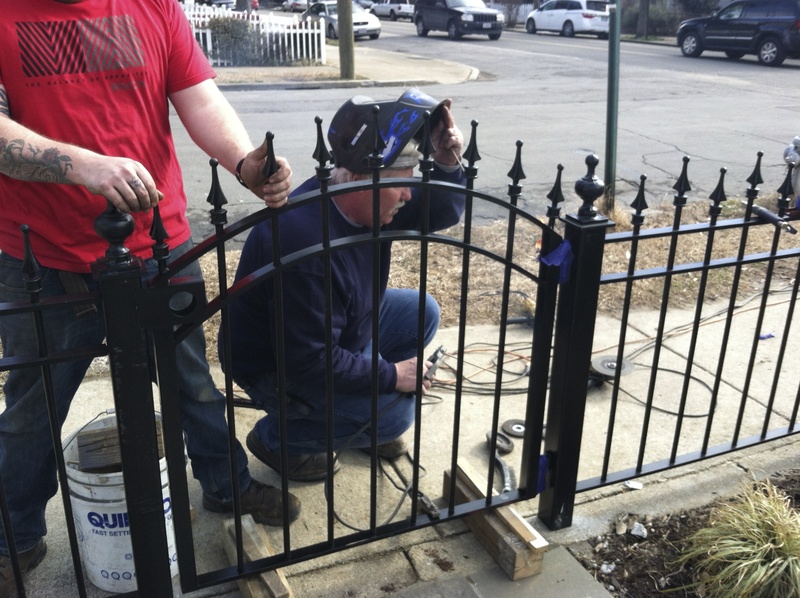 During one of my many strolls through the city I happened across a couple of men installing a fence and stopped to talk with them about the process and the pros and cons about using iron and other materials such as aluminum. Both materials require maintenance, mostly painting, and their prices are fairly comparable. I took their card and later contacted them about making a fence for our yard. They were on their way to New York for a big project and couldn’t help with our little fence. As it turns out, there are just a handfull folks in the iron fence business. I was able to get a few guys to come out and take a look and talk with me. I had some ideas in my head but wasn’t completely sure of what was appropriate for the time period, the location and blending with the somewhat modernization of the home. I needed a real craftsman, an artist to help me nail down the design, someone inspired by my project. Literally, in the first 60 seconds I could tell that the first three people I met with were not the right fit. I wanted to just tell them they could leave right then but that’s really awkward. So they measured and showed me catalogues of pre-made fence and rail options. Only one of those three ever followed through with an actual quote. Noticing that I was a bit distressed by the situation, Bobby suggested that we contact his old buddy, Gary Taylor. 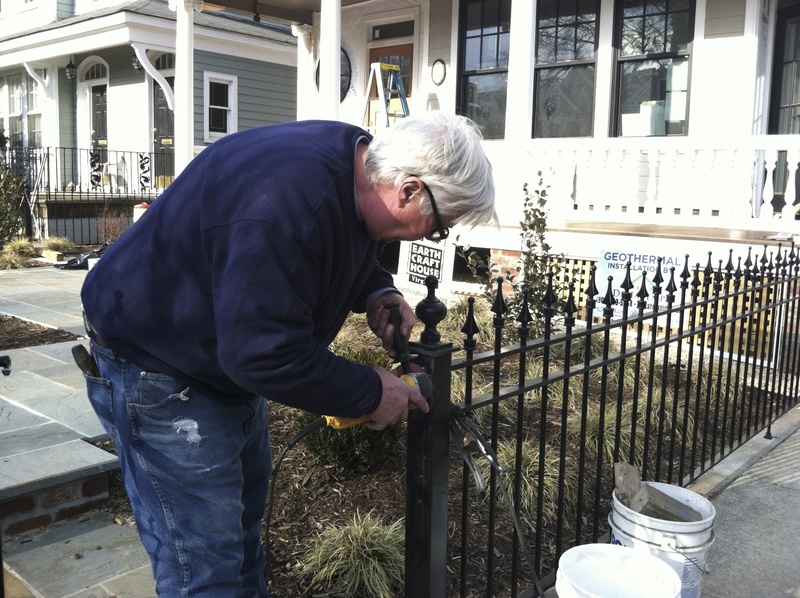 Bobby explained that Gary has been crafting iron fences in Richmond for over 40 years. I knew quickly that Gary was the man for the job. Under his arm he carried a worn photo album of his fences. 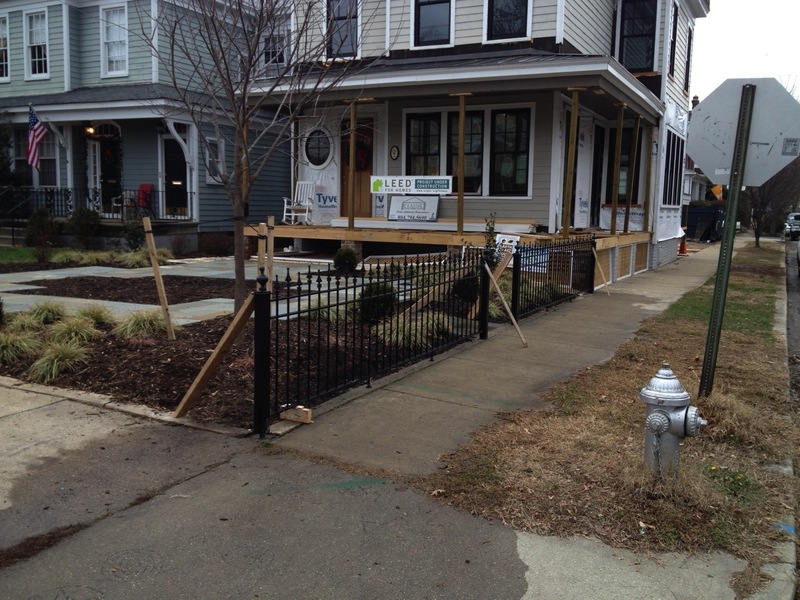 He looked at our corner lot and said “Oh yeah, I can make a beautiful fence for this yard. It will be so pretty, I will send my grandkids to see it!” I described my vision for the fence and he added his ideas. Within about an hour we had a plan. A week or so later he showed up with a sample section. 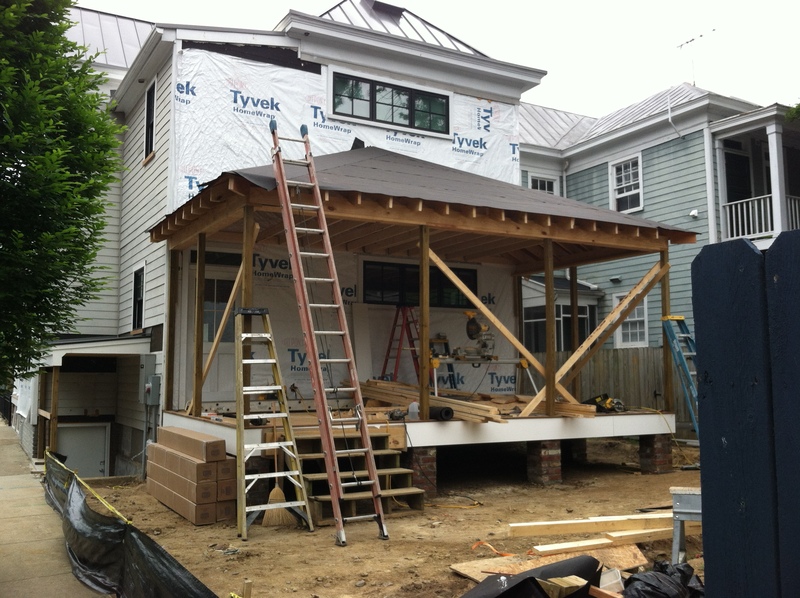 Once we approved the design, Gary went to work fabricating several long sections to wrap around the yard. There are two gates, one at the front and one on the side. Gary attached knobs and latches on site. The fence was an added expense, but we have not regretted our decision for a minute. It adds definition to the landscape and provides a much needed boundary on our busy corner. 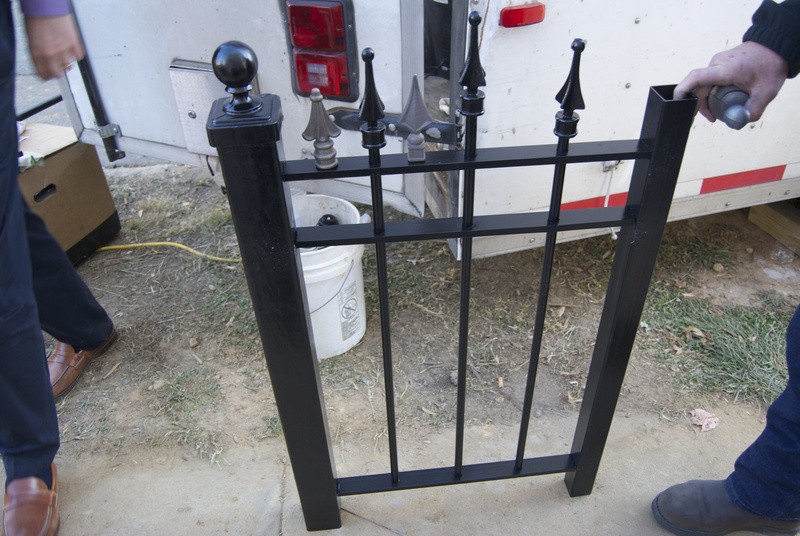 Gary was easy to work with and he took such pride in creating an authentic fence for our home. I already love the sound of the gate latching as it closes! Honor’s Corner Makes her Debut! 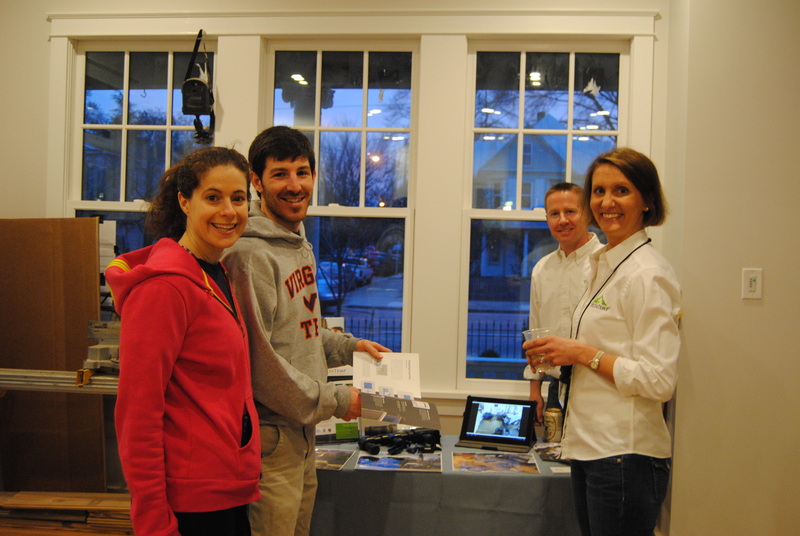 Last night Honor’s Corner served as hostess to the monthly gathering of Richmond’s Green Drinks, part of a national organization with local chapters made up of people dedicated to living sustainably. Green Drinks is a simple and unstructured event where people interested in sustainability can get together to network, learn something new and enjoy some food and drink. 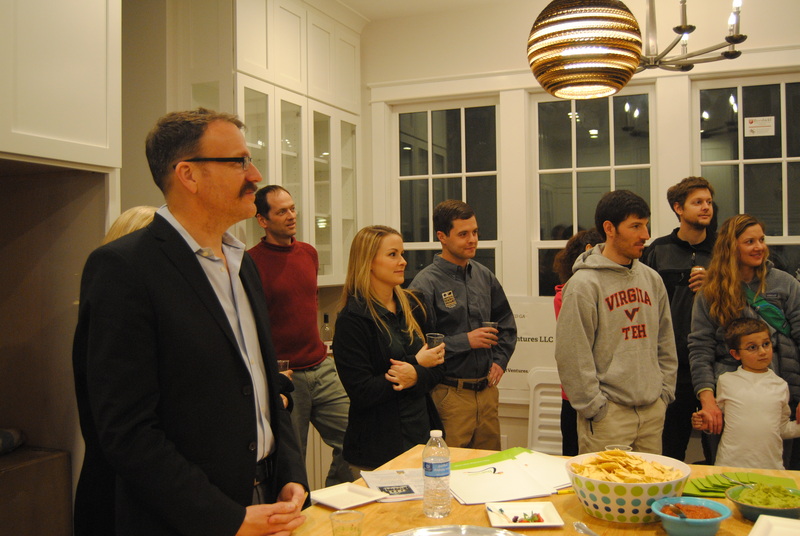 We welcomed about 65 people into our “soon-to-be” home and shared with them some of the nuts and bolts of the house. We were thrilled to have some of the key contributors to the project present to give brief explanations of their piece of the design. I was so wrapped up in the fun and education myself that I really dropped the ball on photos. I am kicking myself for not assembling the team for a group photo! That just means that they all have to come out together again so I can take a picture! The evening began with an amazing sunset! 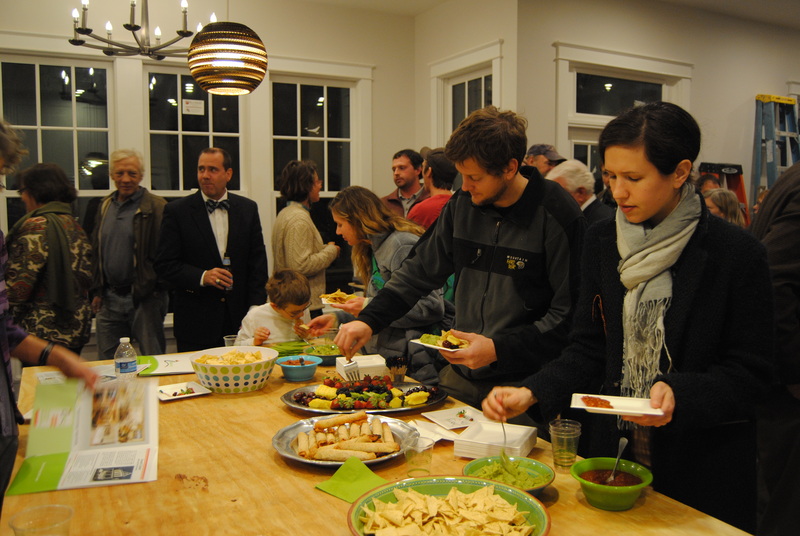 We enjoyed food and drink on our make-shift plywood island top. 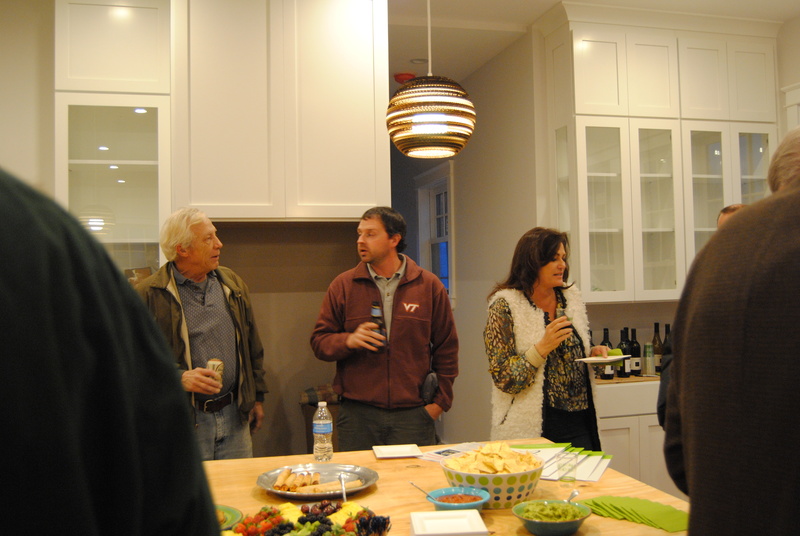 Steve from Cary’s Mill Woodworking shared cabinetry details. 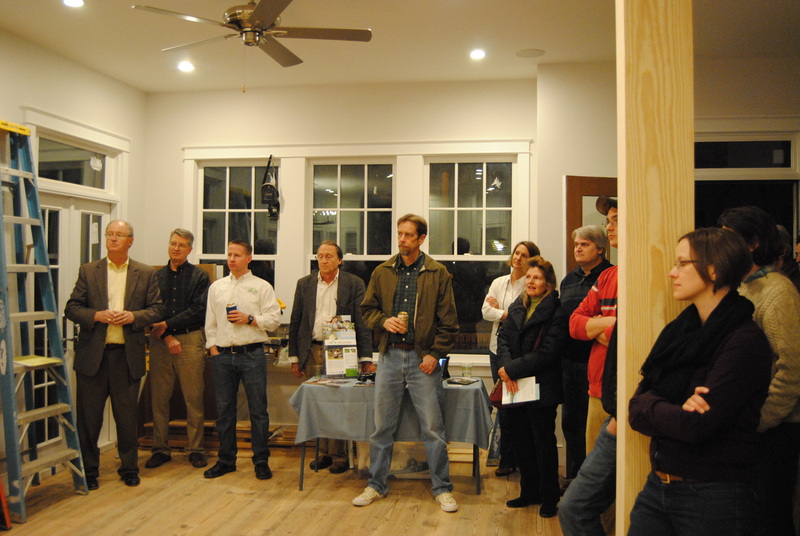 Ellis from Rock Creek Innovations described the BMP for rainwater control and native species landscape design. Attentive listeners include Brad and Stuart from EarthCraft. 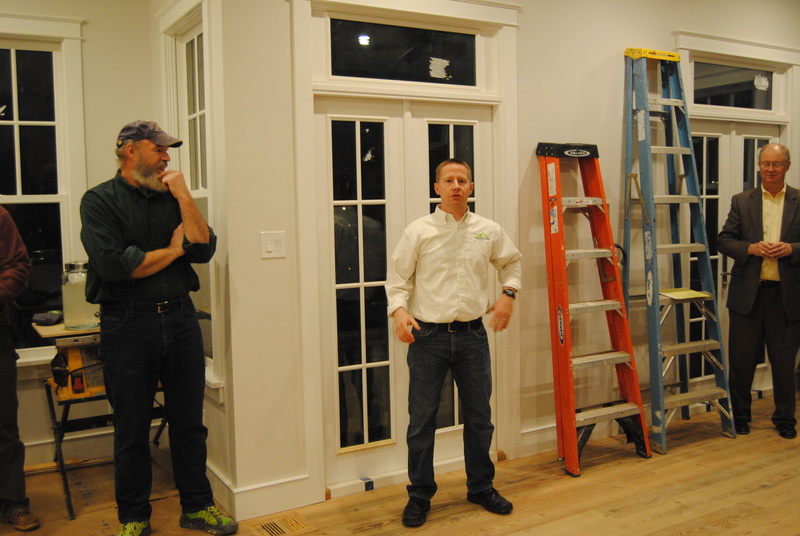 Scott from Custom View shares the saga of finding the perfect windows! 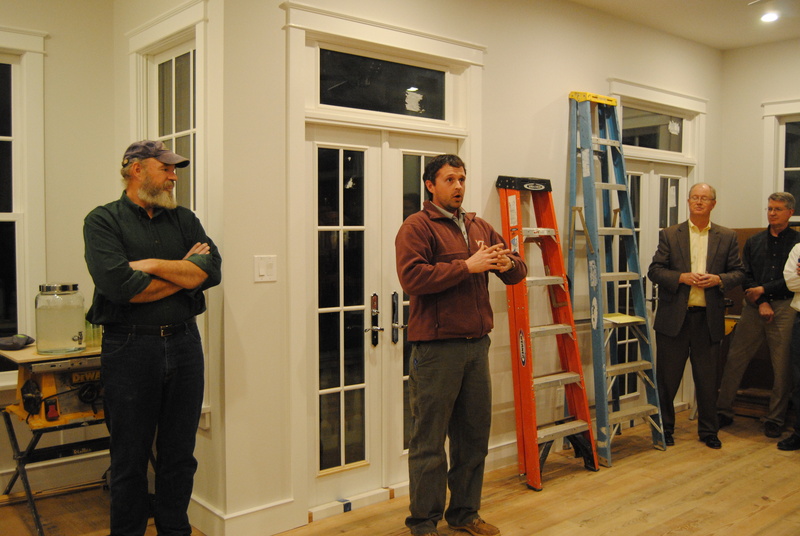 Adam, from Delta Temp, explains the Geothermal Heating & Cooling. 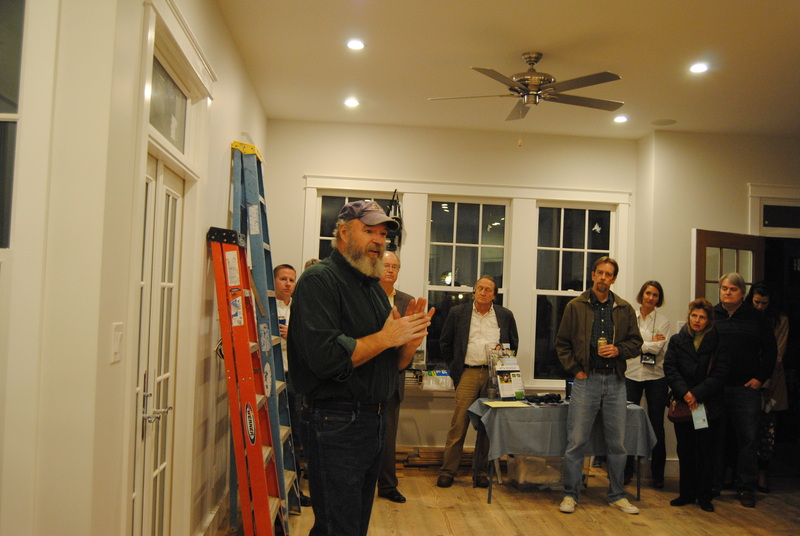 John, our happy builder, gives an overview of the entire project. 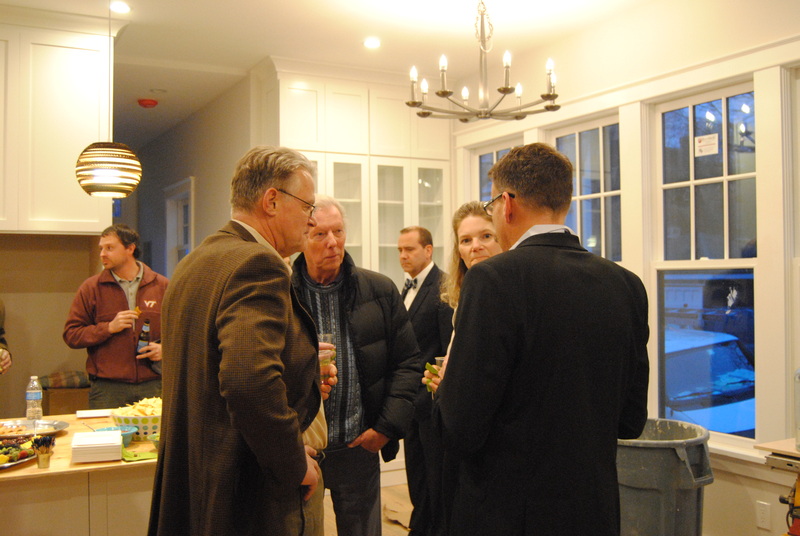 Mingling of guests…Bobby talks with Ellis. I missed Bobby in the crowd and didn’t introduce him but he has been there with John over the past few months adding all the details to the home. Hosting the event means that we must be getting close to move-in day. Thanks for sharing our excitement!